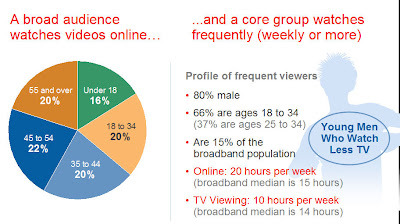 Official Google CPG Blog: Is online video here to stay? Is online video here to stay? Is online video here to stay? According to a new report released by eMarketer (subscription required), the number of U.S. online video viewers from 2006-2011 will grow nearly 50%, to 157 million consumers. 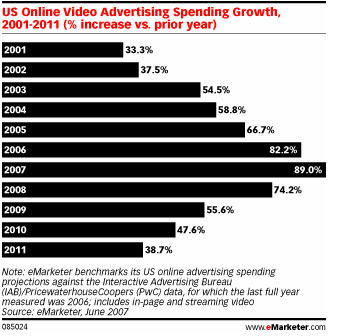 With projected spending growth of 89%, 2007 will show the greatest year-over-year increase for U.S. online advertising. The report also mentions that more people watch video on YouTube than on any other site. According to Hitwise, YouTube’s share of US video site visits reached 60% in May 2007. 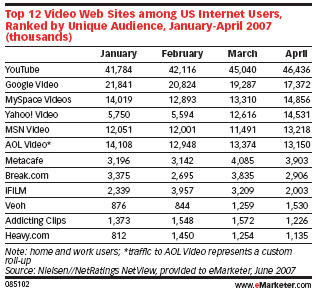 In fact, a recent Nielsen/NetRatings study showed that YouTube had over 48 million US visitors in May 2007. No other video site had even half that number. So the landscape is changing, and one place we see that is with the growth of online video, which is quickly becoming mainstream. Of the people who watch videos online, 63% watch once a week. There is a misconception that only men are watching video online, but you can see that while men do tend to watch more video than women, both sexes are frequent consumers overall. CPG brand advertisers are very attracted to the idea of online video advertising, because you can take advantage of the advertising opportunity to tie products and brands to the interaction and community as well as build relationships with their target markets around video. One example is Eukanuba, a pet food company that also co-sponsors the Annual American Kennel Club Championship. Eukanuba posted a "behind the scenes" look at their commercials that would air during the AKC championships, and video clips of the different breads that competed in the event. How can you leverage video for your brand?